At the helm of the school is the principal. In some schools, the principal is nowhere to be found or everywhere but inside of classrooms. The essential duties teachers would like the principal to make a priority seem like more of an item to check off of the principal’s list. If you ask a principal what his or her main responsibility is one common response is to be the instructional leader of the building. We all know it takes more than overseeing and implementing instruction to be known as a great principal. Principals have to ensure the school is meeting district and state mandates, keep students and staff safe, budget the school’s finances and manage the staff and the operations of the physical building to name a few. The problem comes when no one knows where the principal is or can get access to him or her. Just as teachers must learn how to manage the tasks of their positions, administrators must do the same or they become lost in task completion and respect from their staff decreases. Below, I have outlined the different type of missing principals and how their absence impacts the school they are supposed to be leading. Some principals do not know how to or simply refuse to delegate. These principals fear something will go awry if someone else is responsible for the task. Their days become consumed with a checklist of obligations to meet and they rarely have time to do anything else. Talented teachers who work under a principal like this feel devalued. They know they have the leadership and skills to help complete tasks the principal is struggling to manage and wonder why the principal will not let anyone help. 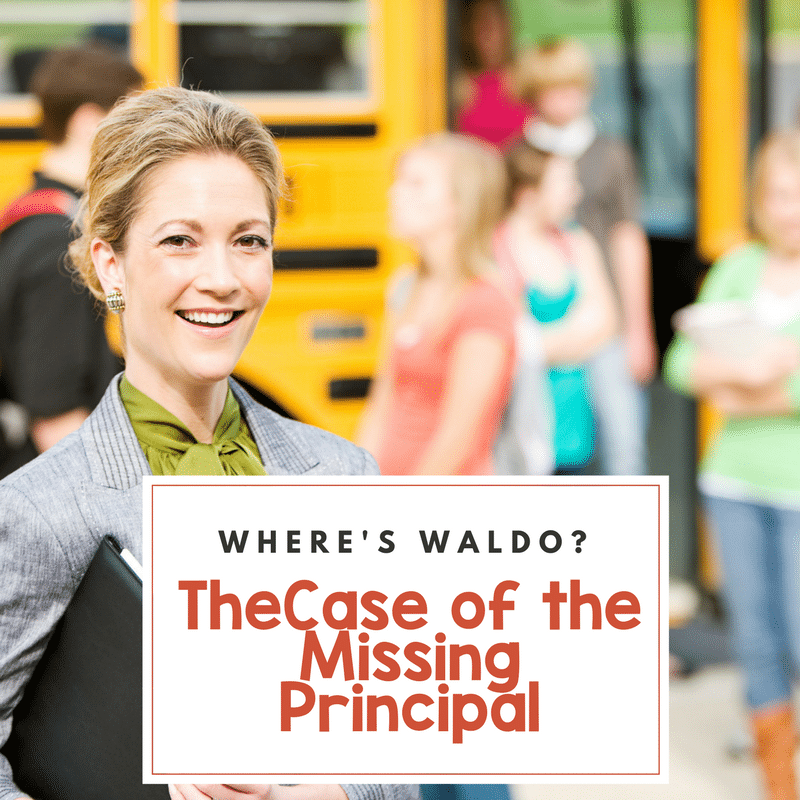 This principal isn’t exactly missing because everyone knows where he or she is – in the principal’s office. This principal’s door is typically closed and locked. Don’t bother knocking or stopping by for a quick chat because you are quickly reminded that the procedure is to talk to the school secretary and schedule an appointment. You would think since this principal is sitting behind the computer you could get a response via email. Nope, If you send an email it is rarely answered. Staff working under this principal wonder what tasks were completed during that time and how all this alleged work is impacting and improving education in the building. Then there are those principals who delegate so much, you wonder why this person is needed. No one knows what this principal actually does. When asked this principal refers you to someone else. The assistant principals under them seem to be drowning under the weight of keeping the school afloat or the assistant principals are running the schools so seamlessly that the principal couldn’t answer a question because the assistant principal or the secretary took care of it in his or her absence. Staff working under this principal have learned not to bother asking the principal for anything. Yes, principals have to attend meetings but some principals are constantly off campus for meetings or constantly having meetings on campus. Teachers only expect to see this principal around observation time because that seems to be the only time classroom visits get penciled into the schedule. Teachers working under this principal wonder if it is the district pulling the principal away so much or if the principal is finding meetings to attend to avoid doing the work. Principals, we need you on campus and in our classrooms. We need you present to know the culture of the school and to build up teachers. This cannot happen without a balance between the multiple aspects of the job. A missing principal is not a leader and a missing principal could find himself or herself without a job. You are too kind. How about the self involved, three year wonders who spent little time in the classroom, and their focus is climbing to the next leadership position. Excellent topic. And it is refreshing to hear that the principal is needed. As a former AP and principal, I agree with you on the need for a principal to be visible. I believe(d) that I was responsible for the learning and growth of ALL individuals in the building. And being visible helped me to support that belief. The research also supports the contention that administrators need to be more visible. It is crucial that we address this concern. But how do we do this? I appreciate the thought and strategies behind the book Get Things Done. It truly helped me organize myself to where I can get the laundry list of things done and still be in the classroom. Furthermore the professional learning called The Breakthrough Coach helped me as well. These works helped me to be in the classrooms. But even more was to have a mentor that valued me and showed me how to prioritize my time and schedule observations of different types. Finally, I had to work four or five hours every Saturday morning and at night to get things done. But what are some other ways that we can help our administrators to be more visible yet get things done without burning themselves out?